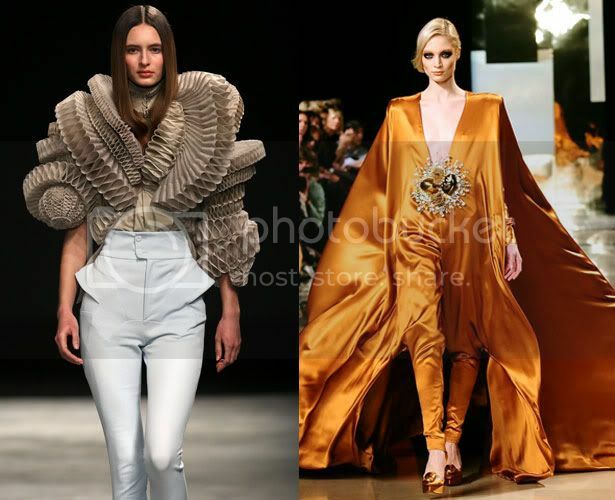 The exquisitely made designs of haute couture are some of the most beautiful and visionary creations to be seen on the catwalk. With superior fabrics and meticulous workmanship behind every gown (and a whole team of people painstakingly perfecting every stitch), it can take up to 400 hours and several fittings to make a single dress. 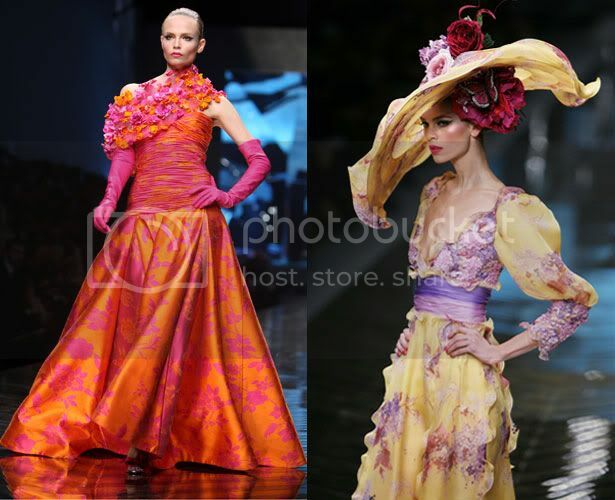 Scroll down to see photos of the most breath-taking and remarkable haute couture designs ever made. 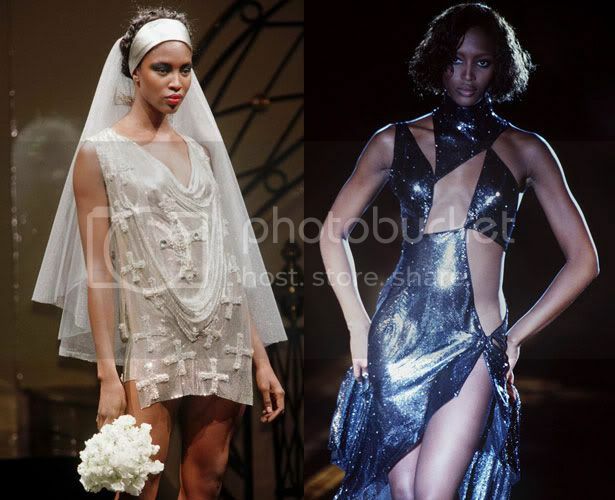 ABOVE: Gianni Versace, known for his flashy gowns loved by celebrities and supermodels (such as Naomi Campbell, pictured), brought exciting, high octane glamour to the couture world when he launched Versace Atelier in 1989. The dresses pictured are from 1999 and 1993. ABOVE: Before his recent fall from grace, John Galliano produced some of the most beautiful and outlandish couture creations whilst at Dior. 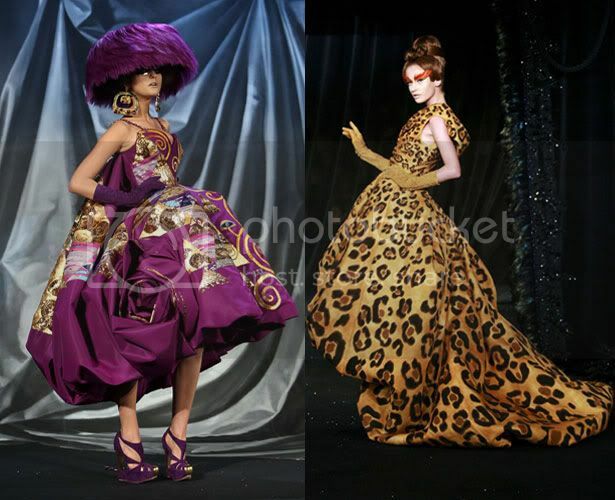 Here is just a sample of some of his out-of-this-world designs from 2008. ABOVE: The 'couture bride' is almost always one of the most show-stopping dresses in a collection. 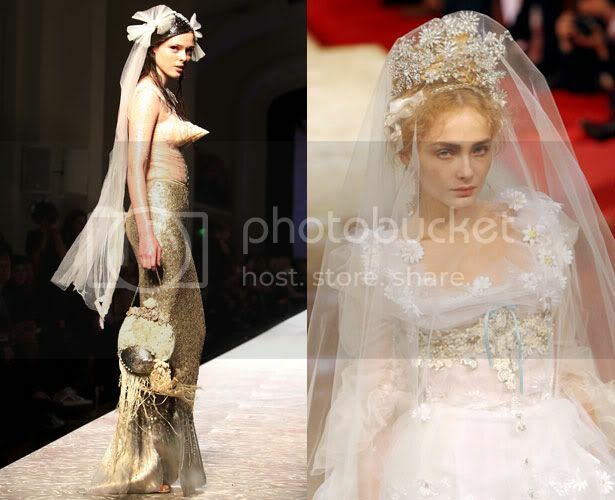 The image on the left is Jean Paul Gaultier's mermaid style bride from 2008 (with a signature conical bra), the right is Christian Lacroix's beautiful bride from his 2006 collection. ABOVE: A concertina-style shirt at Givenchy in 2008, and a dramatic silk train as seen at Stephane Rolland in 2010. 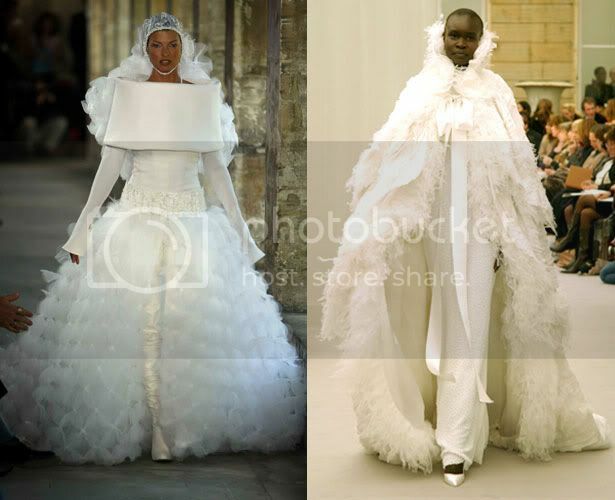 ABOVE: Two all-white creations by Karl Lagerfeld by Chanel - Linda Evangelista in a ruffled wedding dress in 2003, and Alek Wek in a feathered cape in 2004. 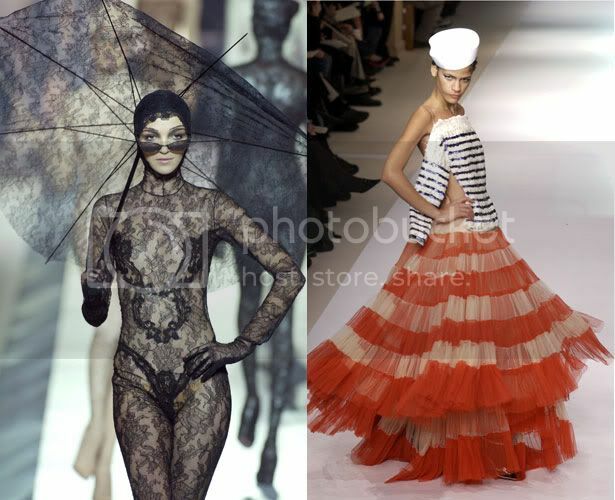 ABOVE: Two Jean Paul Gaultier creations - an all lace bodysuit, and nautical inspired dress ( A Gaultier trademark) from 2003. 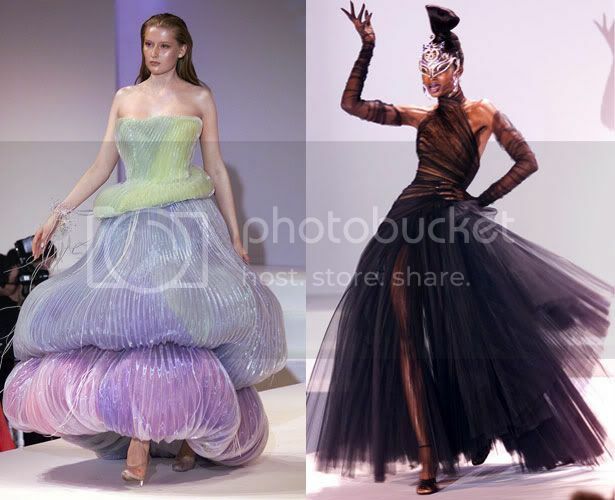 ABOVE: Thierry Mugler showcases two dramatic designs during Paris Haute Couture week in 1999. ABOVE: These romantic dresses were part of Valentino's final couture collection in 2008. For the finale, he sent all the models down the catwalk in simple red gowns - his signature colour. ABOVE: The dress on the left was shown for designer Yves Saint Laurent's last ever collection - A/W 2001. 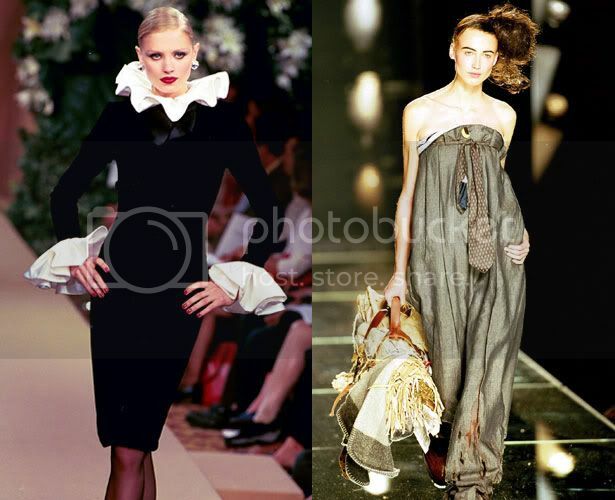 The dress on the right was for John Galliano's now infamous collection for Dior in 2000, where he claimed to be inspired by Paris's homeless people. Which is your favourite Couture creation from our selection - or did we miss any legendary gowns off the list? Share details of your dream dress in the comments section below.